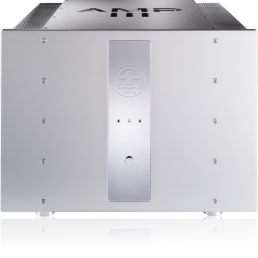 The AMP III is based on the amplifier technology of our legendary AMP II amplifier and is designed for customers seeking maximum power who also want audiophile amplifier performance. The AMP III therefore has the 4 separate final stage circuit boards from the AMP II and combines these in such a way that respectively 2 boards are available for each channel. Both these boards are also divided with an inverting and non-inverting signal component. The AMP III with its symmetrical technology is therefore a completely unique power amplifier. An amazing 48 hand selected MOS FET transistors together with 2 enormous 1600 VA transformers deliver huge power. Due to the extremely high performance and the concept according to the Class A/AB principle it should be noted that the AMP III is only destined for loudspeakers which exceed a minimum impedance of 4 Ohm. In fact 8 Ohm systems are preferable – for those looking for a little more.